My family have been eating cake around me all week and I have passed it up everytime. I’ve learned from experience that while it may sound and look incredible, I don’t always enjoy it. I don’t know why, I think it’s because I’m used to eating ‘healthier’ alternatives now, that sometimes normal cake just doesn’t do it for me. Even so, I’ve been craving cake this week; something rich, decadent and chocolatey, which is when I decided to go through my Pinterest for ideas. I came across this recipe by ‘The Pancake Princess’ – Ooey gooey, chocolate oat cake. I track macros, so I adjusted the recipe accordingly and it was quite the success. I did however, forget to add the milk so the texture was a little ‘claggy'(stuck to the roof of my mouth) but I still enjoyed it with some light squirty cream and blueberries. 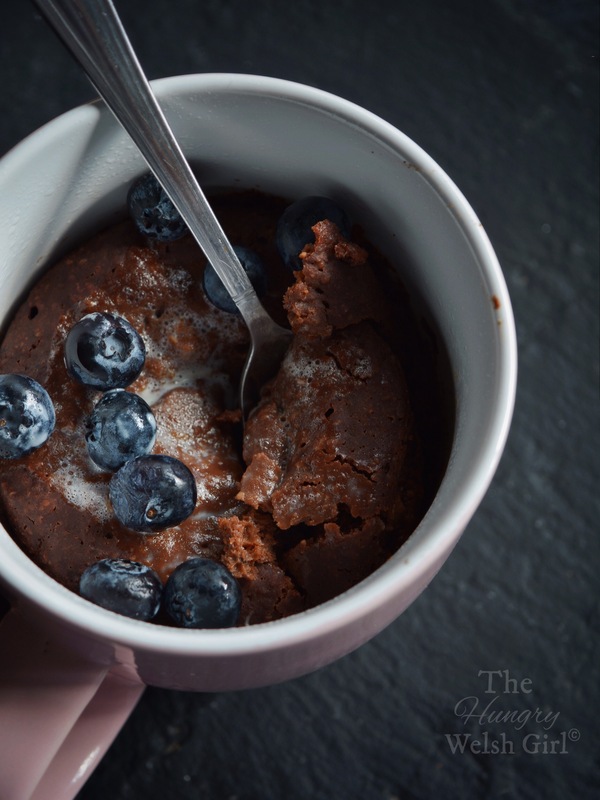 The one thing which was different with this mug cake, was that it was steamed, instead of microwaved. I’ve never actually steamed anything before, let alone a cake, but it was delicious and a lot less dry than if you’d used a microwave. To steam this mug cake I used my bamboo steamer, which I received for Christmas last year, so a great excuse to dust it off and try it out, but any steamer will do! Also, after seeing the pancake princess’ beautiful photography last night, I did some reading on ‘Dark-light photography’ and decided to try my hand at it today. It’s quite tricky, but a style of photography which I enjoy far more than the standard, more common photography. Before starting you will need to switch on your steamer or if you are using a bamboo steamer, boil a saucepan of water with the steamer on top. Place the oats in a food processor first and blitz them into a flour, before proceeding to add the other ingredients and blending throughly. 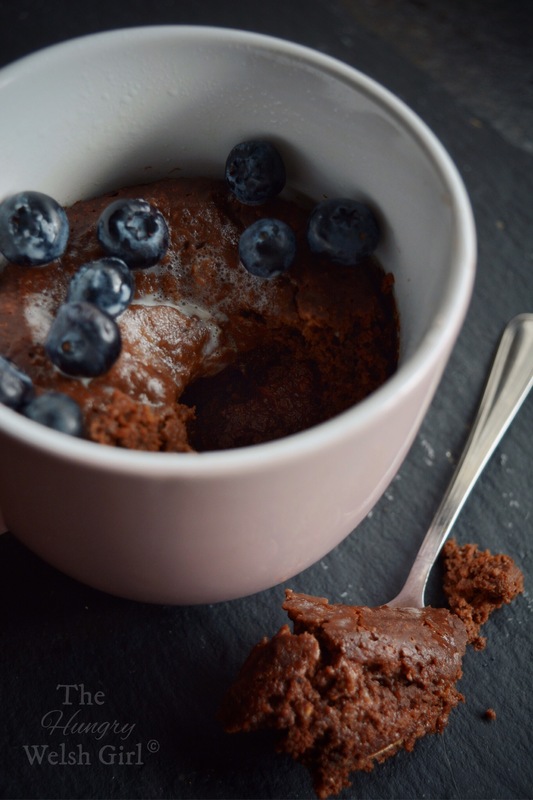 Grease a mug with some low-fat spray or coconut oil and pour your cake mixture into the mug. Now add it to your steamer for 15minutes or 10 if you would like it a little more gooey. You could also add a dollop of peanut butter in the middle or chocolate chips. Mmmmm this would a good way to quickly satisfy a sweet tooth!